Storage space has always been a major issue for growing small businesses, schools, medical centers, homes, and more. For as long as companies do business, schools enrolling students, medical facilities treating patients, data will continually be created, and the demand for storage will incessantly rise. RAIDage has once again intuitively designed a storage system for anyone or entity who needs storage space, but have limited work space. 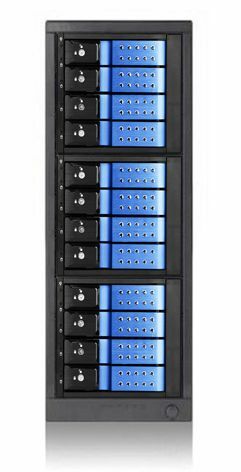 RAIDage features high performance storage towers DAGE1240DE-ES, DAGE1540DE-PM, and DAGE1640DE-4MS. All three models support 3.5” SAS I/II & SATA I/II/III, and with an optional high performance raid controller card, they could have transfer speeds of up to 6.0GB. Using a high performing host controller, their large storage capacities can also be configured 1/0/5/10/JBOD raid configurations, which depending on the configuration has the potential to duplicate a hard drive more than once for zero downtime. Each of these models also has different features and benefits; the eSATA 12 bay DAGE1240DE-ES is a one port to one connection that means it only needs three cards on the back. The eSATA 15 bay DAGE1540DE-PM is one port to five connections, which means that this model only need three eSATA cards that allows for simple storage management. Lastly, the MiniSAS 16 bay DAGE1640DE-4MS, which is one port to four connections, meaning that it only needs two to four MiniSAS cards on the back. In other words with two cards in the back, you can divide your drives into two collective hard drive. In any case, these towers can maximize your storage space, protect your data, and allow you to manage your data efficiently. RAIDage’s storage towers, DAGE1240DE-ES, DAGE1540DE-PM, and DAGE1640DE-4MS, will give you all the benefits of the peace of mind that data is highly failure-proof yet easily accessible. Nevertheless, iStarUSA Group is available for all your OEM ODM project needs.